The clinic has moved closer to the hospital, making it more convenient for both the surgeons and patients. 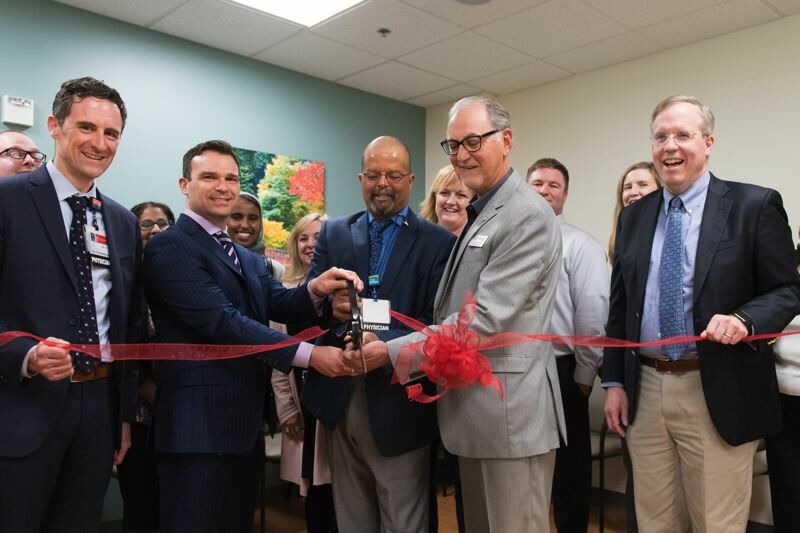 Tuality Healthcare has moved its neurosurgery clinic to a new location administrators are confident will better serve patients, and they celebrated with the Hillsboro Chamber of Commerce on Friday, June 15, at the clinic's official grand opening. Previously located on 48th Street and Cornell Road in Hillsboro, the clinic was about a 15 minute drive from Tuality Community Hospital in downtown. Being that far from the hospital posed some threats for patients and often inconvenienced others, according to Ben Bertrand, a physical therapist and service line director at Tuality Healthcare. "The types of patients that we see in neurosurgery are really complex, and so it can require a fair amount of hands-on care where the surgeons need to be relatively close to their patients," Bertrand said. "The proximity to the hospital, being across the street, has allowed the physician's a lot more flexibility in caring for their patients who are in the hospital, along with patients in the clinic." Since April 23, the clinic has been operating from its new location across the street from the hospital, 333 S.E. Seventh Ave.
Bertrand said easier access to the facility and timeliness are among the greatest advantages to the new location for both the physicians and the patients. "If there is an issue in the hospital, they can deal with it immediately and the patients that are in the hospital after surgery are able to access their surgeon so much quicker," Bertrand said. "Neurosurgeons are going to be immediately across the street. If someone shows up at the emergency room with a brain bleed or a stroke, they are going to be there to provide an assessment much, much quicker. .... It's just better continuity of care." While the new clinic is "much smaller" than the last, Bertrand said it's "definitely more functional," and will provide better, faster and more flexible care for patients. Because the clinic was previously far from the hospital, many patients waiting to see their physician at the clinic often had appointments cancelled, as the surgeons were having to make the emergency trips to the hospital across town. "If there's an emergency that happens over at the hospital, it's one of those situations where (the surgeons) just have to go, because its life and death," Bertrand said. "We may not have to (cancel appointments) or the patient could wait, or we just wouldn't have to potentially put the patients that are being seen at the clinic, out. From that perspective, it should improve the patient satisfaction."